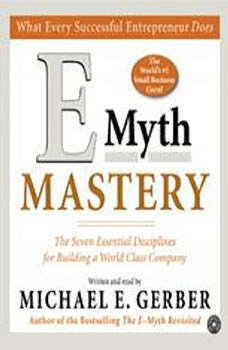 Michael E. Gerber, the world's leading small business guru and bestselling author of the phenomenally successful The E-Myth Revisited, presents the next big step in entrepreneurial management and leadership with E-Myth Mastery. This audiobook presents a practical, real-world program that can be implemented in real-time in your business.Gerber shows that most businesses fail because of a crisis of vision that creates an inevitable cloud of misdirected activity. Presenting practical exercises to help small business owners recover their vision and passion, he clears a path for getting back to the basic disciplines for business success.The E-Myth credo -- Don't work IN your business, work ON it -- is spelled out here in the seven essential disciplines followed by every leader of a world-class enterprise. Each discipline provides the leadership keys for unlocking success in the critical areas of business development:• Leadership • Marketing • Finance • Money • Management • Client Fulfillment • Lead Conversion • Lead GenerationE-Myth Mastery is the ultimate business development program that will help you recover your passion and turn your company into a world-class operation -- a turn-key machine for the money and satisfaction that only a successful entrepreneur can enjoy. Get started today!